WHEELS: 18" X 7.5" CAST ALUMINUM (STD), TRANSMISSION: 8-SPEED AUTO (8HP45) (STD), TIRES: P235/55R18 AS PERFORMANCE (STD), QUICK ORDER PACKAGE 29H -inc: Engine: 3.6L V6 24V VVT, Transmission: 8-Speed Auto (8HP45), MANUFACTURER'S STATEMENT OF ORIGIN, GRANITE PEARLCOAT, ENGINE: 3.6L V6 24V VVT (FFV), ENGINE: 3.6L V6 24V VVT (STD), BLACK, SPORT CLOTH SEATS, Window Grid Antenna. 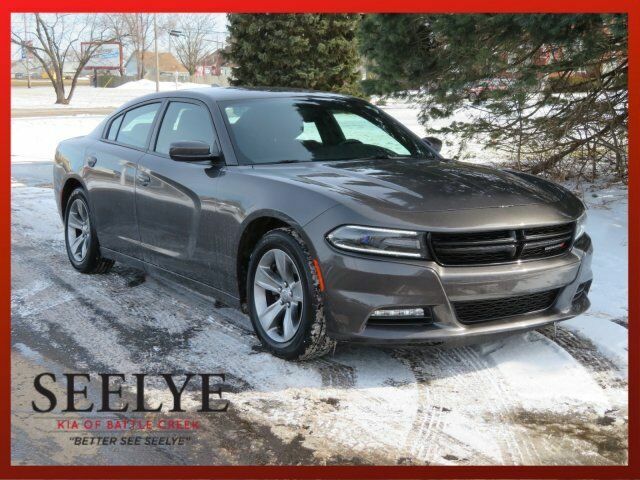 This Dodge Charger has a dependable Regular Unleaded V-6 3.6 L/220 engine powering this Automatic transmission. Voice Recorder, Vinyl Door Trim Insert, Valet Function, Uconnect w/Bluetooth Wireless Phone Connectivity, Uconnect Access Emergency Sos, Trunk Rear Cargo Access, Trip Computer, Transmission: 8-Speed Auto (8HP45), Transmission w/AUTOSTICK Sequential Shift Control, Tracker System, Touring Suspension, Tires: P235/55R18 AS Performance, Tire Specific Low Tire Pressure Warning, Systems Monitor, Streaming Audio, Steel Spare Wheel, Sport Front Seats w/Power 4-Way Driver Lumbar, Sport Cloth Seats, Speed Sensitive Variable Intermittent Wipers w/Heated Jets, Smart Device Integration.